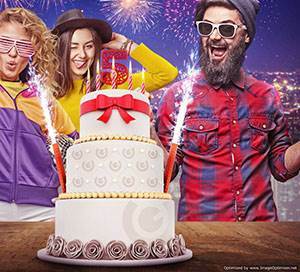 The online casino Guts is celebrating their 5th year with a fantastic raffle where one lucky player can win €/$100,000! There are also other prizes up for grabs, including iPhones and iPads! First, you need to Opt-In to take part in the promotion. You can do this on the website in the promotional details. You can get 1 raffle ticket by playing a minimum of €/$1 on casino, sportsbook and/or poker products in any week of the promotion. 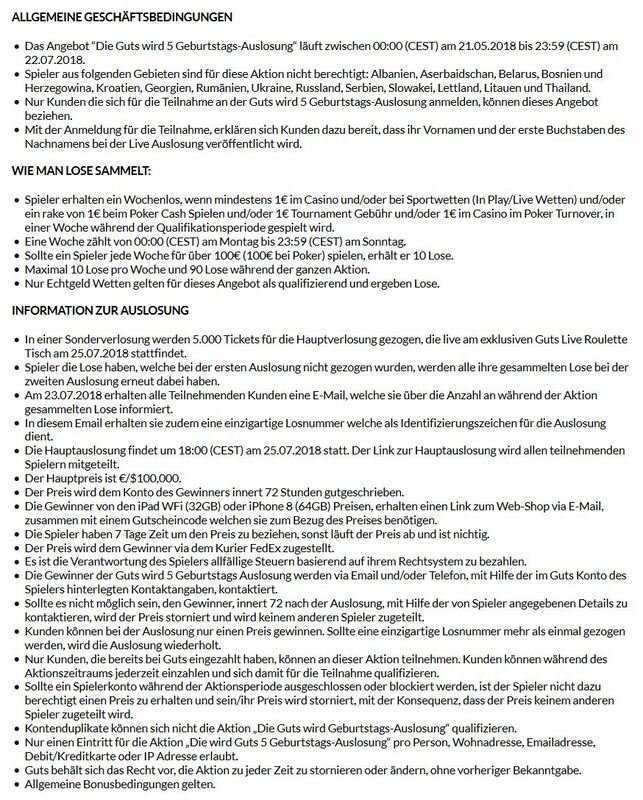 If you play for over €/$100 you will get 10 tickets. You can get a maximum of 10 tickets per week and 90 over the whole campaign. Keep in mind that only real money bets will qualify and earn raffle tickets. Customers from the following countries are excluded from taking part in the promotion: Albania, Azerbaijan, Belarus, Bosnia and Herzegovina, Croatia, Georgia, Romania, Ukraine, Russia, Serbia, Slovakia, Latvia, Lithuania and Thailand. A pre-draw of 5,000 tickets will happen on the 23rd of July. The participating customers will get an email with how many tickets they accumulated during the campaign. They will also get a unique raffle ticket number, which will be the identifier in the main draw. The main draw is scheduled for the 25th of July at 18:00 (CEST) at the Guts Exclusive Live Roulette. The main prize is €/$100,000, and it will be paid to the winner's casino account within 72 hours! Other winners will be notified by email on how to redeem their prizes. Please note the full details of the promotion, which are available on the website and here. Celebrate the 5th Birthday of Guts Now! Guts is an established online casino that offers many interesting regularly changing promotions and tournaments where players can win great prizes. Aside from that the website offers casino games, sports betting and access to a poker network. There are hundreds of games from many of the most popular developers available and new players are also greeted with a great welcome offer. Everything there is to know about Guts is available in our detailed review.